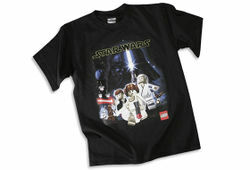 TS41 Star Wars Original Trilogy T-Shirt is a Star Wars themed T-Shirt released in 2007. It features Princess Leia, Han Solo, Luke Skywalker, Chewbacca, Darth Vader and assorted troopers on it, as well as the words "LEGO" and "Star Wars". Facts about "TS41 Star Wars Original Trilogy T-Shirt"
This page was last edited on 9 January 2016, at 21:03.